ROAD TOWN, Tortola, VI – October 13, 2015 was seen as a significant day in the lives of the differently abled children of the Eslyn Henley Richiez Learning Centre as they became an inspiration to many in the community and had the opportunity to interact with Miss World BVI Sasha O. E. Wintz. 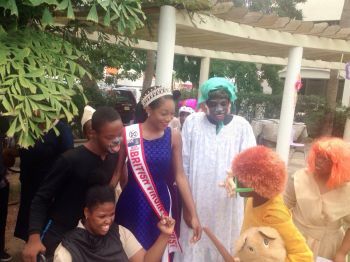 As part of their ‘Reading is Fun Week’ activities, the Eslyn Henley Richiez Learning Centre hosted the ‘Book in the Park’ for the creative celebration of reading where Miss Wintz made a guest appearance. This year, students dramatised the story, ‘Alton, the Jolly Postman and Other People’s Letters’ by Janet and Allan Ahlberg, a production which was well received. Ms Wintz told this news site that she genuinely and personally invested in the wellbeing of the differently abled within this community. 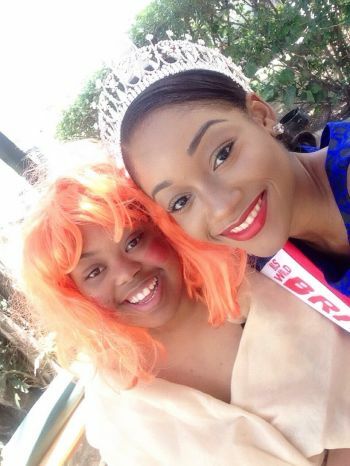 “I have learnt through my own interactions with my cousin Jaquan and my friend Malesh, who are both diagnosed with Downs syndrome, that a little patience, some kindness and lots of love can make the world of difference to those among us with special needs,” Miss Wintz said as she addressed the activity at the Noel Lloyd Positive Action Movement Park yesterday. To also concrete her support for the ‘Book in the Park’ initiative, Ms Wintz donated a number of books and other items that will aid with literacy and make learning fun. “Once again, I thank you for giving me the opportunity to exercise my platform of being an advocate for the differently abled, I count it a great honour and I pledge my full support in whatever capacity you deem necessary. Just call me,” she said. The children of the centre entertained the many who came to support the event as well as passersby who dropped in. Ms Maurine C. Hodge told this news site that she was very impressed not only by the children entertaining but especially by the level of support of volunteers, their relatives and the cross section of persons who supported the event. “They are not castaways and I would love to see them more in the community doing things like this. This was beautiful here today and I am happy the BVI is a home of very nice people and I glad to see we not hiding these children in a corner. They are humans but just differently abled,” said Ms Hodge. This activity is in keeping with the Miss World BVI platform 'Dealing with children with authism'. That is why she is there representing. 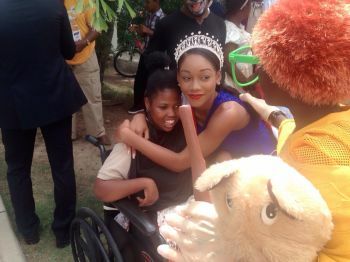 Good job Eslyn Henley Richiez Learning Centre and thank you Miss World BVI for working with those who really need our help. Keep up the good work guys!